Sailing the Sea of Thieves can be a little tricky at first, especially with the ongoing releases of expansions. We’ve assembled this guide to help you with your very starting steps as a pirate, from getting into the game to starting your first voyage and finally spending your hard earned currency on some booty. When the Arena expansion hits, you’ll choose between The Arena — a fast paced PvP mode — or Adventure. This guide will handle starting in Adventure. You pick your ship — the two-person sloop, the three-person brigantine, or the four-person galleon — and your crew type. An open crew matches you with strangers, and a closed crew allows you to sail with only friends you invite. Players can spawn at any random outpost in the three regions of the world: The Wilds, The Shores of Plenty, and the Ancient Isles. There is a fourth region, the Devil’s Roar, to the east. Players must manually sail there to adventure in that region, and you cannot begin at Morrow’s Peak Outpost. Once you start the game, you enter the tavern. The tavern contains Duke, who gives weekly event and expansion dialogue, gear, and quests. He distributes special voyages, like the Christmas Golden Voyages or the Mercenary Voyages for the free week. If there isn’t an event running, leave the tavern and enter the outpost. Outposts are full of supplies. Get in the habit of checking the barrels around you — you can often find useful things, including ship supplies, cursed cannonballs you can use as weapons, and even voyages. Down by the docks will be your ship, waiting for you to climb aboard when you’re ready. Outposts contain vendors, who sell cosmetic skins for your equipment. There is no “leveling up” or better gear. The goal is to acquire gold to trade for cosmetic items — and have fun on the seas while you do so. You’ll need to earn some gold to spend first. To do that, you’ll need to acquire a voyage. You can hold three voyages at a time, and they do not start until you activate them upon your ship. To activate a voyage, go to your ship’s voyage table. Every member of the party can propose a voyage by pressing F on PC, or X on Xbox and selecting their voyage. Crew members can then vote by pressing F (or X) on their voyage of choice. Once the majority of a crew decides, a voyage is activated. You can check your voyage requirements by holding E on PC or right bumper on Xbox, and checking the icons in the circle. Completing voyages often requires you to use tools. Hold Q on PC or left bumper on Xbox to use the weapon wheel. The use of each item is pretty straightforward — a shovel allows you to dig, the lantern provides light, and so on. The musical instruments are briefly used in some quests, but mostly they’re just there for you to play shanties upon the sea. Nice! 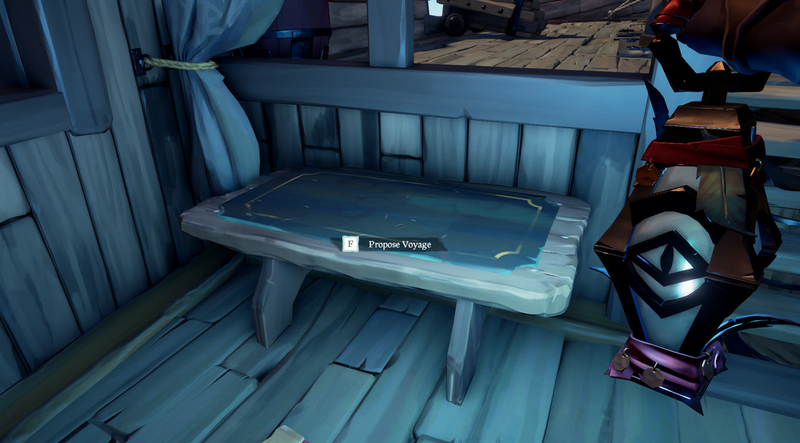 The voyage table on a sloop. Voyages primarily come from three factions on each outpost. The first is the Merchant Alliance. 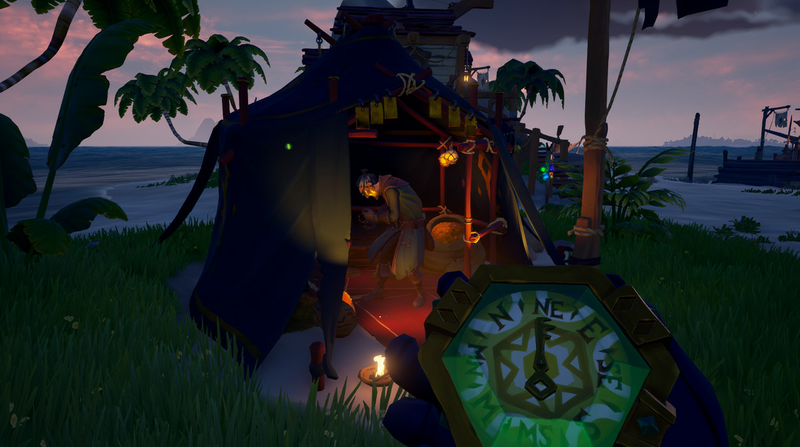 The Merchant Alliance representative is on the dock of each outpost, with a tarp over her head. She will distribute voyages for you. Press F or X to interact with her, and you can choose a Cargo Run or a Shipment. A Cargo Run asks you to pick up some silk, rum, and/or plants and transport them to a destination. You must keep the silk dry, protect the rum from shattering, and water the plants before they wither on the way to your destination. The better shape you keep your cargo in, the more gold you acquire. Pick up the shipment from the specific person that the manifest requires, check the labels on the goods, and then deliver them to the appropriate character. There are three kinds of animals: chickens, snakes, and pigs. Small islands will only have one kind of animal on them, but large islands can have two. Players have to feed captured pigs with bananas upon capturing them, or they will eventually starve to death. Players charm hissing snakes using music, and charmed snakes dance and stop spitting poison. The Order of Souls are in purple tents with an eye motif. They sell voyages to hunt down skeletons on specific islands. Up to four skeleton captains will spawn on each island that the voyage tells you to go to. 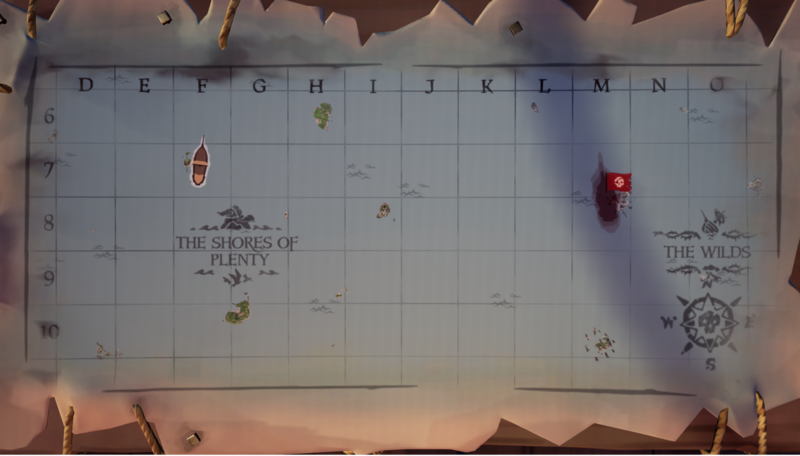 You can check which islands to travel to and how many skeleton captains there are by holding E or right bumper and checking your voyage icons. Golden skeletons who rust in water and take more damage from guns. Once you kill skeleton captains, they drop skulls. 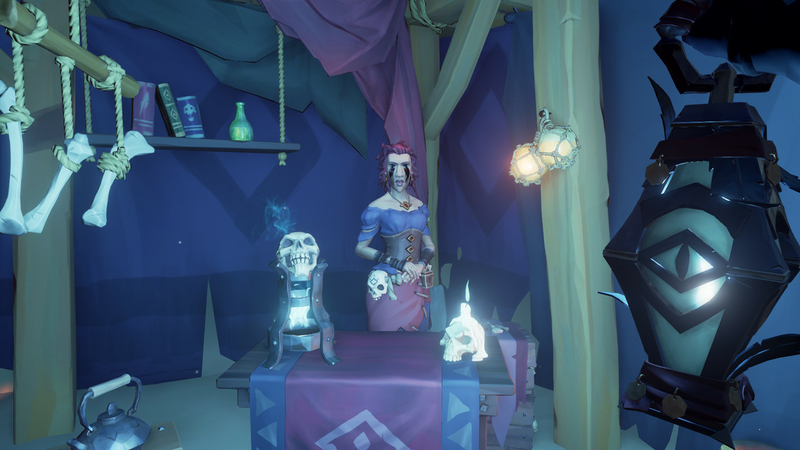 You can sell those skulls to any Order of Souls merchant at any outpost for gold. The Gold Hoarders stay in dark green tents with key symbols. The Gold Hoarders sell maps to treasure, and ask that you bring the chests you find to any Gold Hoarder at any outpost for gold. Sometimes, these maps are literal X marks the spot treasure maps. Other times, they are multi-step puzzles. Either way, you’ll need to hold E or right bumper, check your voyages, and head to specific islands. Once you’re on the island, you’ll need to either track the X or solve the puzzle, and then dig up a chest using your shovel. Here’s where the handy dandy map table comes in. This table shows the entire map. You can zoom in to see individual islands and names, or you can scroll out to see regions. Other ships can mark themselves with the Reaper’s Mark, a symbol that identifies them on the map and allows you to see them from a far distance. Once you identify where you need to go, it’s time to start sailing. Lift your anchors, drop your sails, and use the wheel to steer. Practice makes perfect when it comes to sailing. For more information and help, check out our Sea of Thieves sailing guide to pick up the basics. You have a health bar belonging to your pirate, which you can see in the lower left of your screen. If you die, you find yourself on the Ferry of Souls for a brief period of time. You can then return to your ship. Find the banana barrel on your ship and eat up from the equipment wheel to restore health. Your ship also has its own health system. Taking damage will rip holes in the hull. The wood barrel gives you wooden planks. Use these to repair the damage in your ship by holding F or X near the hole. Finally, you have cannonballs. Each ship has cannons and cannonballs. (You can also find cursed cannonballs in the world, which have special powers like making your opponent’s ship drop its anchor or making its crew vomit.) This is your way of defending yourself upon the seas. This should be enough knowledge to get you set off on our first journey over the seas. Before long, you’ll be yar harring and plundering with the best of them.